I love coffee. I really do. I wasn’t always that way, however. Coffee came to me later in life. I loved the smell and hated the taste…up until I became a barista. Then…life sort of changed. And not only, over time, did I develop a taste for coffee, but I now knew how to properly make it. …I mean having a treat with my morning cup of coffee. And one of my two favorite morning treats with coffee is a biscotti. The other is my homemade madeleines…but I digress. Well, it just so happened that my March 2015 Cuisine Cube had a container packed with biscotti for the “Breakfast” portion of the box. YAY! For those of you not familiar with Cuisine Cube…think about how awesome it would be to have lesser-known, smaller company, artisan gluten-free company products shipped straight to your door once a month. Think of the joy opening said box would bring you and how trying new things entices you. You get a product for breakfast, lunch, dinner, snack, and dessert. And sometimes…you get a bonus. Who doesn’t love a bonus? If that got your heart pumping, that’s what Cuisine Cube is all about. And, this subscription service is available for as low as $29.99/month. Pretty awesome, yes? You betcha. So, if you’re curious and want to try something new and exciting and different…hop over to their site. Because, sometimes, you get products in the box that are like Dolci di Maria Gluten Free Classic Biscotti. I mean, it’s a treat to have while you drink your wine, your coffee, your tea…whatever. Have it any time of the day, but I like to go the classic route and dip my biscotti into my morning coffee. It is love. And who doesn’t love starting off their morning with a cookie, right? Technically, I suppose a biscotti is consider a biscuit, twice baked so that it is extra dry and crunchy. And if you’ve never had one…you’re totally missing out. Dolci di Maria was created by Mari Tantillo, who created gluten-free and dairy-free desserts for her two young children who had food allergies and sensitivities. She was urged by her friends to start selling her desserts because they were so delicious. Dolci di Maria strives to create fine gluten and dairy-free desserts that strike a perfect balance with texture and taste. Everything is baked fresh with natural and organic ingredients. Even better…many of the products offered by Dolci di Maria are vegan. So, with all of that being said, this week I decided to stop looking at the container of biscotti that came in my Cuisine Cube, and finally open it up and have one with my morning coffee (a delicious local blend, for those wondering). Despite being a dry treat (they are meant to be dipped, after all), I always take my first taste without anything else. That way I can judge what something tastes like and if I like it. 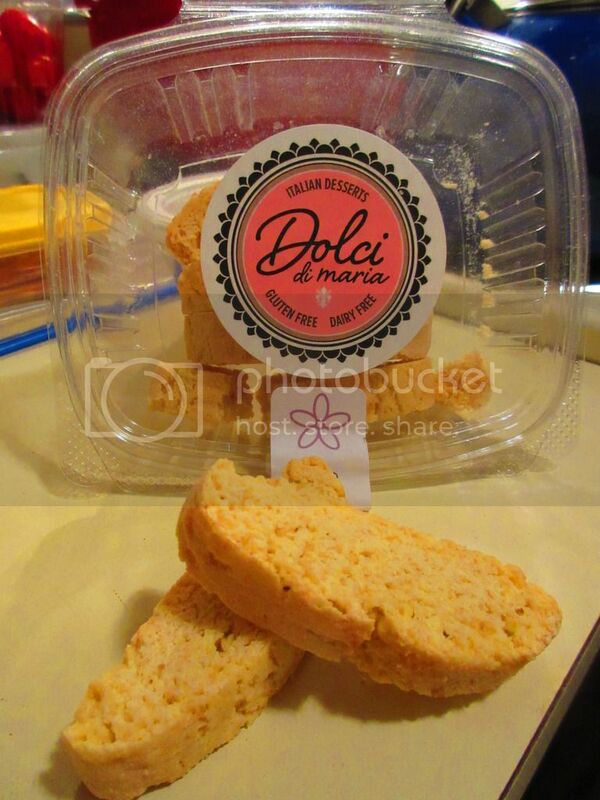 And…when it comes to the Dolci di Maria Gluten Free Classic Biscotti…I like it…but I don’t love it. It has nothing to do with the actual biscuit itself. It actually has a great texture to it…and it holds up to the coffee dunking, that I do religiously when I get gluten-free biscotti in my clutches. So that was the part that I was okay with. The part I wasn’t okay with, when it came to the Dolci di Maria Gluten Free Classic Biscotti…was the overwhelming licorice flavor. I hate licorice. And this biscotti definitely had a heavy taste of it. I inspected the ingredient list on the bottom of the package and discovered the use of anise. That will do it. It was just…too much for me. I think I was hoping for something with more vanilla flavor than the anise. It didn’t go well with my coffee…nor did my tastebuds really enjoy the licorice flavor. A little bit of anise goes a long way…and in this batch…it took it too far. The biscotti itself is great…the flavor just didn’t work for me, and that’s more of a personal preference than anything else. So, let’s talk about the ingredients that are in the Dolci di Maria Gluten Free Classic Biscotti, shall we? These classic Italian treats are made from brown rice flour, pure cane sugar, cage-free eggs, potato starch, tapioca starch, Earth Balance™, baking powder, xanthan gum, anise and vanilla extract, and sea salt. The nutrition information for the Dolci di Maria Gluten Free Classic Biscotti is very nice though. You don’t feel so bad treating yourself at breakfast to a crispy Italian biscuit when you look at these stats. A serving is 1 of the biscotti, which will give you 65 calories and 2 grams of fat. You will be consuming 73 mg cholesterol, 102 mg sodium, 2 grams of sugar, 2 grams of protein, and 8 grams of carbohydrates. These have no fiber. If you don’t mind the flavor of anise (or that licorice-like flavor) than you will probably love everything about the Dolci di Maria Gluten Free Classic Biscotti. For me, the texture was great…it was perfect for dipping, but the anise flavor just overpowered the rest of the biscuit and, for someone like me who dislikes licorice, it was a bit too much. That being said, now that I know I can find Dolci di Maria products at my Lucky’s Market in Louisville, Kentucky (discovered that via the Web site), I am curious to try other products as she has brownies, pancakes and other flavors of biscotti to see if I like them better. At least I got a morning treat in my Cuisine Cube this month. The Dolci di Maria may not have enticed my taste buds, but I now know to look for other products in my area that might play nicer with my palate. This entry was posted in Baked Goods, Brownies, Coffee & Tea, Cookies, Cuisine Cube, Dessert, Food, Gluten-Free, Italian, Products, Review, Snacks, Sweet Stuff, Vegetarian by The Celiathlete. Bookmark the permalink.